A tree has a better chance of thriving if it is planted in a spot where it can grow to its mature size and shape. Also, maintenance costs will be lower. Before selecting and planting a tree, consider its function in your landscape. Above: Unattractive and weak V-shape due to pruning for overhead wires. Above: Beautiful crab apple tree is a nice size, but sheds apples on sidewalk and cars parked along the street. Consider public impact! 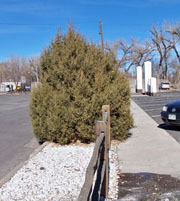 Above: Fluffy Rock Mountain Juniper extends over the street and over the sidewalk. Makes it difficult to walk on the sidewalk or clear the street. Environmental Factors: What does your tree need? Hardiness zones are important. Alamosa is mostly Zone 3 and Zone 4. If you live in town where there are lots of houses, streets, and trees for protection, you are mostly Zone 4. If you your home is less protected from wind and has fewer dwellings and trees, you are more likely to be Zone 3. The last few years we haven't dipped down to -30 or -40, but we did in the 1980's. Think long-term when considering a tree. Alamosa is about 7,500 ft. This is find more many trees, but some don't thrive at this altitude. It can be hard to find elevation values for some trees and different sources may vary. We've included as many as we could find in our tree index. In general, Alamosa is naturally very arid. Our typical rainfall is 6-8 inches. However, if your tree will be in a well-watered lawn, or near the river, it may get plenty of water. Most tree roots only grow between 12-18 inches below the surface. Consider the lighting conditions where you want to plant your tree. Think both about seasonal and daily lighting. Alamosa is known as "The Land of Cool Sunshine"; most days are very sunny. Some trees, like pines do best in full sun. Others, like maples, are tolerant of a wider range of light conditions. Know your soil. Alamosa ranges from sandy to clay, and most native soil does not have many nutrients. Further, soil compaction from vehicle traffic or construction can hamper the tree's ability to send out roots and receive air, water, and nutrients. In general, Alamosa has fewer pests than many places as it is high, cold, and dry. However, many cottonwood and willow species are loved by aphids. Some trees, such as Robinson Crabapples, are virtually pest free. Unless you live on a busy street, the ability for your trees to tolerate air pollution is not a major problem in Alamosa. And, the more trees we have, the less the air pollution problem will be. Tree Factors: What do you want? Why are you going to plant a tree? And why in a particular place? Alamosa has very sunny summers and many people want shade. Shade cools our homes and yards. Make sure to consider winter shade, which most of us don't want. Will the tree block sunny windows or solar collectors? Make sure to consider the angle of the sun both summer and winter. Higher, wide-crowned trees that drop their leaves in winter provide the most shade. 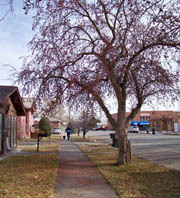 Medium trees do well in Alamosa as most require less water and most homes are one-storey. Are you looking for a variety of shape and color? Do you have a large or small space? What other trees and shrubs do you have? Are you trying to screen an eye sore or create a windbreak? Dense, low branched evergreens may be the best option for screens. Stepped, mixtures of dense trees may provide the best windbreaks. Are your trying to delineate a property boundry? Small, narrow-crowned trees might be best. Consider whether branches and roots will invade your neighbor's yard. This may be the most overlooked consideration. 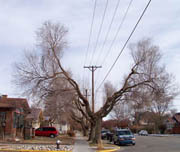 Consider many of the large trees planted under powerlines in Alamosa -- what were people thinking? The only reason I didn't place it first is that it may not be the first consideration in thinking of planting a tree. Envision what the tree will look like 5, 15, 35, 80, etc. years from now. Hard to imagine, but really, really, try! We don't plant trees just for ourselves -- they are for future generations. Do you have a narrow space? Consider a columnar (tall, narrow) shape. Do you want a single tree to spread shade over a large circular area? Consider a round, oval, or V shape. Community Factors: How does your tree fit into the Community Forest? Many of the beautiful, but aging, trees in Alamosa are Cottonwoods or Siberian Elms -- as much as 40% of the public trees in the Community Forest. Consider selecting a tree from the Tree Board Approved list. We thank Tree City USA for much of the general information on this page.